J had been asking to go on a cycling holiday since he saw his parents do a big charity bike ride earlier in the year. Being only six means his legs can tire easily. So the prospect of riding at least 10 miles every day for a week is daunting. That, and at 6 years old I think he is too little to be riding his lovely Islabike on the road. He is brilliant on it but I can’t guarantee he will stick to the inside line and follow instructions – key factors to guarantee his safety when riding on busy roads. 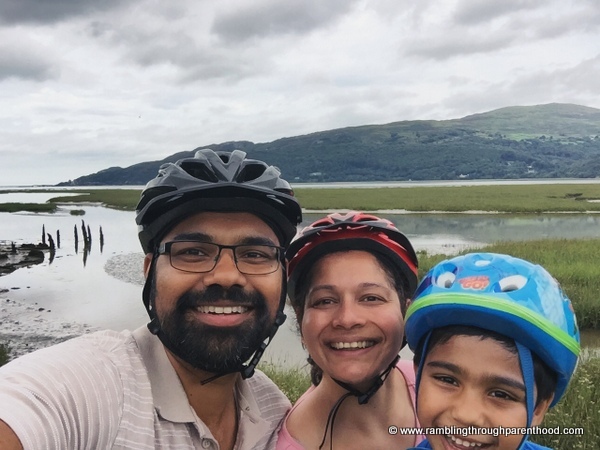 So instead of a cycling holiday, we decided to do cycle rides through the summer on car-free, family-friendly routes. The first big one we did was on our week-long holiday in Wales. 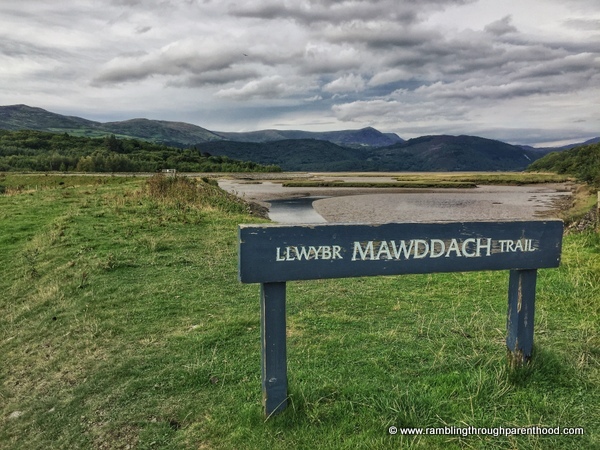 You can read more about our Welsh itinerary here, if you haven’t done so already. 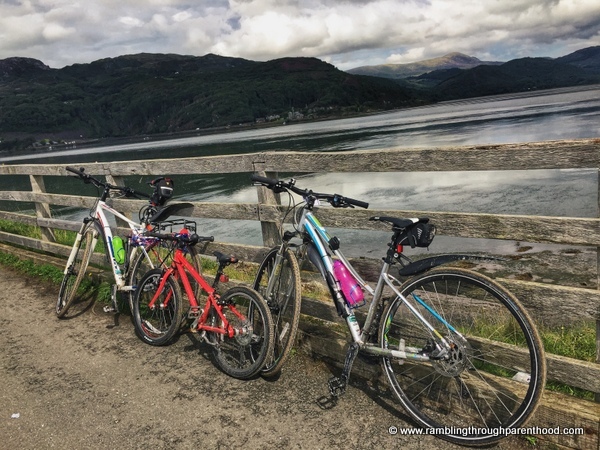 We chose to cycle along the Mawddach trail that goes 9.5 miles from Dolgellau to Barmouth along a disused railway track on the southern edge of the stunning Mawddach estuary. 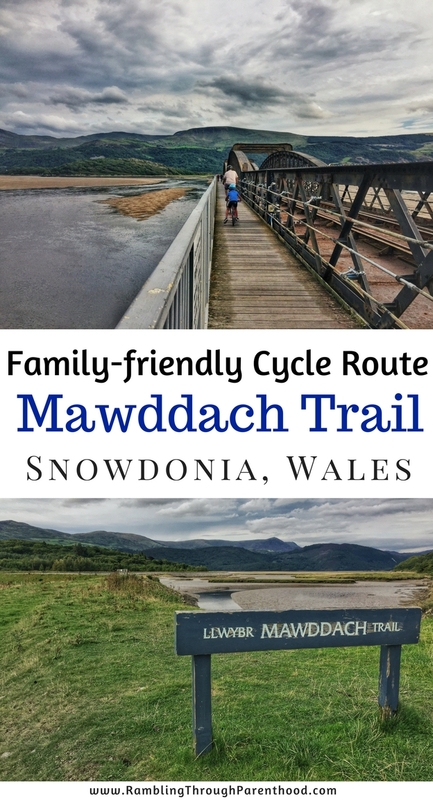 You can cycle the Mawddach Trail beginning at either end. 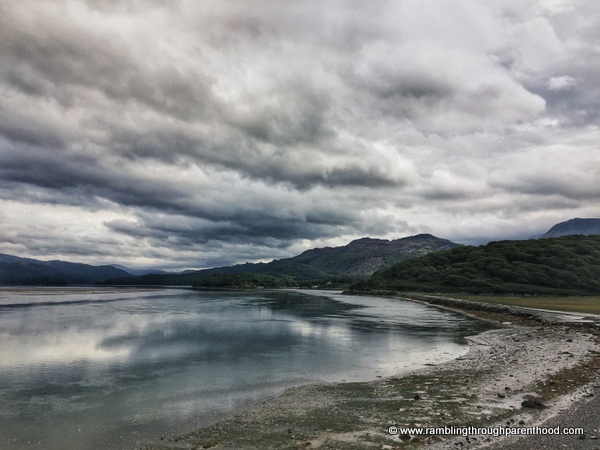 We set off from Dolgellau, as we were staying near there. 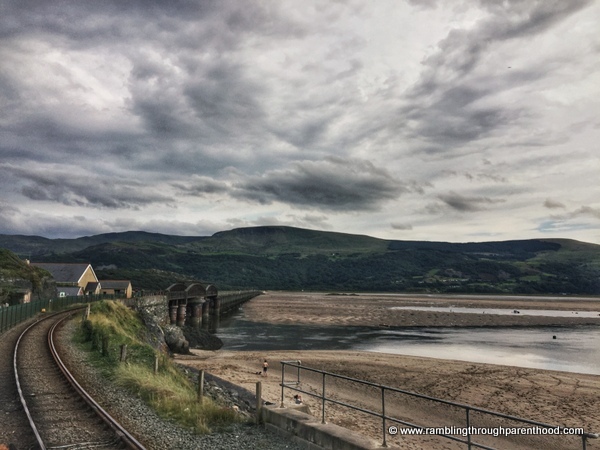 You can start off from Barmouth as well. There are some nice family-friendly caravan parks around that can serve as a holiday base. 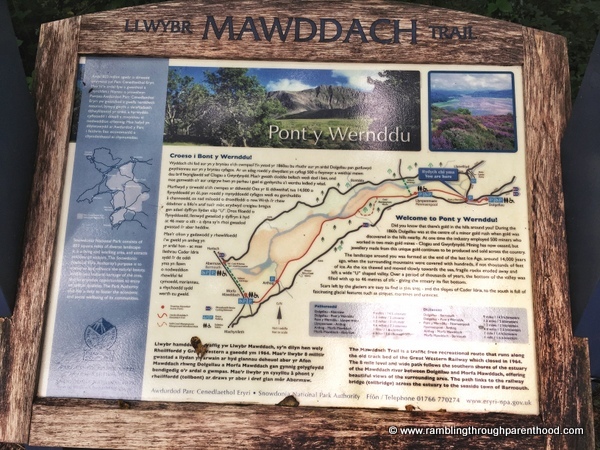 Having loaded the bikes in the car, we drove from Bala to Dolgellau and parked in the long stay car park near the local rugby club. The start of the ride was across the road and at the far end of another car park. J was hesitant initially, for though the route is car-free, it is extremely popular. So there were plenty of other cyclists and walkers on the way going in both directions. He kept braking abruptly and swerving from side to side. It took a lot of coaxing and a few stern words before he was riding confidently again and keeping his line. We loved how the trail is very well marked throughout. It meant there was very little chance of losing the way. It also meant we did not have to keep consulting Strava or Maps for the route. We also loved how the route is flat all the way through, making it suitable for all abilities. If you don’t fancy a bike ride, you can simply walk along it. It does get muddy in places, so be prepared for a messy ride, especially if you have a six year old who enjoys nothing more than to ride through muddy puddles at speed. Also be prepared to hop off and back on your bike as you negotiate bike gates along the way. 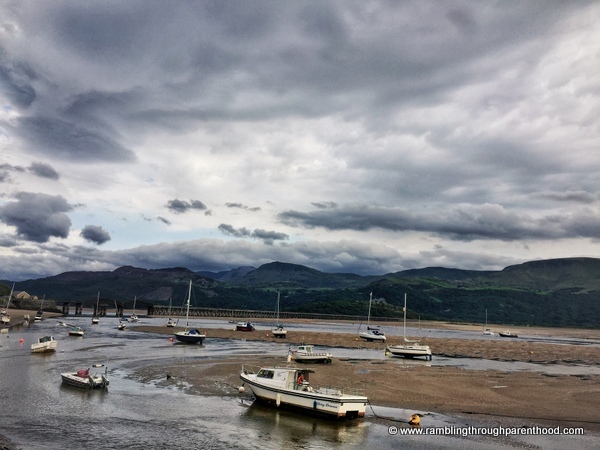 There are toilets at a couple of places and at either end in Dolgellau and Barmouth. There are free car parks too, so you can join the trail at any point if you don’t fancy doing the entire route. We carried a picnic in our backpacks, always a good thing when you are out and about on a family adventure. There were picnic tables at regular intervals along the route where we stopped for a snack and a drink. 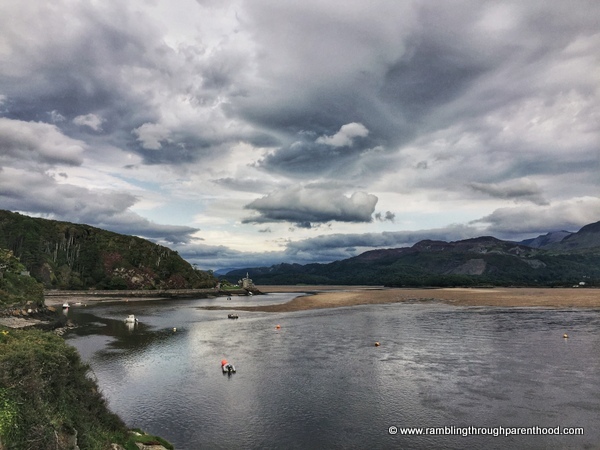 By the time we got to Barmouth, we had exhausted our stock and were ready for some delicious local fish and chips followed by ice-cream. 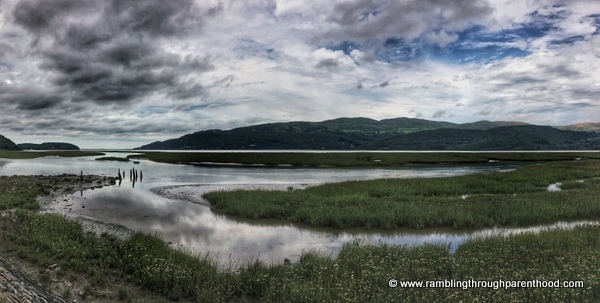 As we neared the half way point, the meandering river opened up into a magnificent estuary. It was high tide, so the water flooded in almost to the edge of the cycle path. 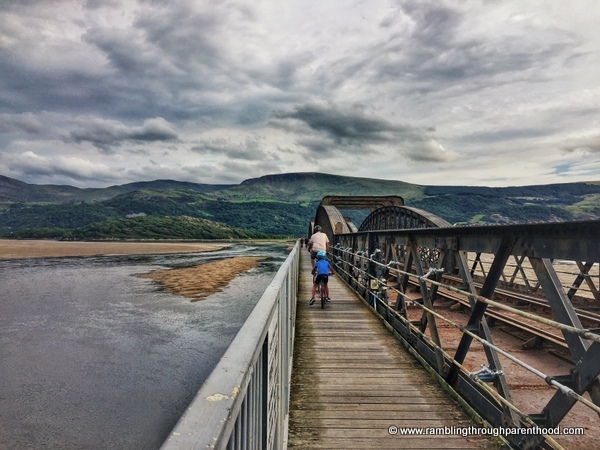 The route ends in Barmouth by crossing the majestic railway bridge across the estuary. The path caresses the railway track along this part of the route, so you are but an arms-length away from a passing train. The views across the estuary from here are spectacular and the entire experience is exhilarating. A short steep climb after you come off the bridge brings you to the very busy main road into Barmouth. Turn left here to head into town, crossing the road with extreme care to get onto the pavement on the opposite side. This done, it was a case of wheeling our bikes down to enjoy the sights and smells of Barmouth. More confident riders can ride down, but we preferred to walk our bikes along this busy road. J wanted to play on the beach. So we spent the afternoon watching him dig holes and build castles in the sand. It was soon time to ride back. 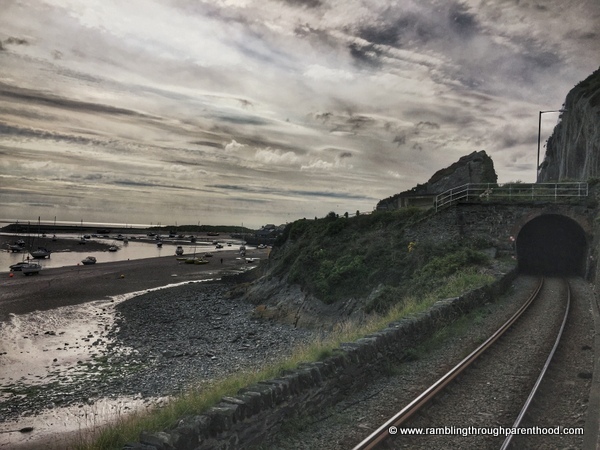 The tide had ebbed, meaning although the route remained the same, the views had altered dramatically. It made the ride back that much more interesting. Back we went, across the bridge, which, by the way, creaks as you cycle along it, adding to the sense of adventure. J finished with a burst of energy, pedalling furiously as we passed under a canopy of trees just before Dolgellau, pretending to be a steam train puffing through a tunnel. We cycled a total of 20 miles and were in the saddle for just over 3 hours. M and I could not be more proud of how well J handled himself on this ride.